In March Sam was contacted by a producer of NBC’ Universal’s The Maury Show located in Connecticut USA inviting Sam to appear on Maury’s once a year segment called Maury’s Most Talented Kids. Maury flew Sam accompanied by his Mother and Brother out to the show for a special shooting engagement for the show which is currently schedule do air on April 2nd 2013. Sam and his entourage were treated like royalty being picked up and escorted to the airport with another driver waiting for them at JFK in New York when they landed. They were taken directly to their Hotel and then again transported back and forth to the studio for the two day shoot. Sam had a blast appearing with five other acts that were also chosen for this special event. Be sure to tune in for the correct time for the show in your area by using the button link called WHERE TO WATCH: located on Maury’s Website. The button is located just to the right of his social link icons in the center of the page. You will have an opportunity to vote for Sam at the end of the show and a winner will be declared after the votes are tallied. 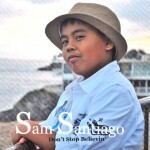 Please support Sam by watching the show and voting for him! I appreciate your time visiting my site and your comment is very encouraging.